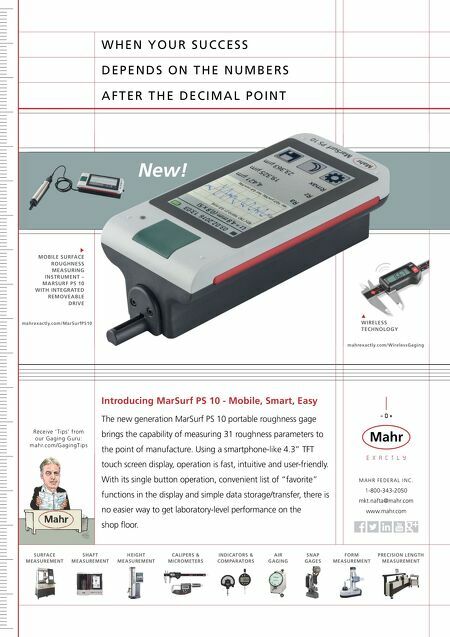 98 MMS March 2017 mmsonline.com BETTER PRODUCTION Shops Using Technology C onventional manufacturing of precision rifle barrels has typically involved manual hand- lapping of a barrel's bore surface twice, before and after the rifling profile is created. Although a bright, hand-lapped bore is considered one of the hallmarks of a precision rifle barrel, there are inherent variations from barrel to barrel due to th e m a nu a l n atu re of th e of te n te d i o u s a n d Honing System Eliminates a Gun Barrel Lapping Operation PAC-NOR BARRELING PROBLEM Manual lapping of gun barrels tedious, time-consuming SOLUTION HTE honing machine from Sunnen RESULTS Eliminated manual pre-lapping, improved barrel consistency monotonous lapping process. More than a year ago, Pac-Nor Barreling Inc., a custom manufacturer catering to bolt-action rifle shooters, addressed this issue by purchasing a newly developed Sunnen HTE honing machine. This machine has all but eliminated Pac-Nor's pre-rifling lapping operation, which is the more difficult and time-consuming of the two lapping operations. Pac-Nor is also producing as many custom barrels as ever, but with a slightly smaller staff. "Our objectives with the honing machine were to build a better product with less labor, and it has exceeded my expectations," says Casey Dichter, production manager. "The hone produces a consistency in bore diameter that is head and shoulders above lapping, within two to three millionths of an inch end-to-end when it's really dialed in," he says. 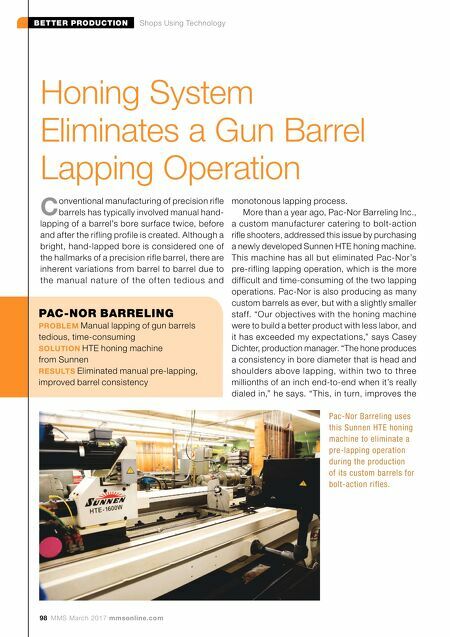 "This, in turn, improves the Pac-Nor Barreling uses this Sunnen HTE honing machine to eliminate a pre-lapping operation during the production of its custom barrels for bolt-action rifles.